I am not sure how I got into this habit whenever I am upset I bake something I like and that lightens up my mood. 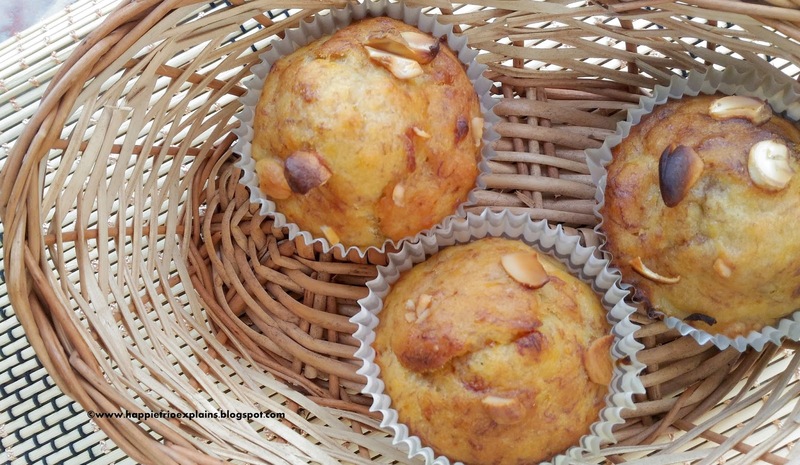 This post is one among them .After a busy stressed day at office when I came back home I found a batch of over ripe bananas I couldn't waste them Hence I turned them into Banana Muffins .Do I have to tell you they tasted and smelled too good ? Yes they did J and did I tell you they are butter less and egg less J Wont the mood lightens up when the house smells heavenly with this baked healthy banana goodness. Now let’s get to the recipe..
1. In a large mixing bowl add in 2 large bananas. Over ripe banana works best for this recipe .Mash the bananas using a fork until its mashed well. Now add in Oil and Vanilla essence .Mix everything well. 2. To the mashed bananas add in the powdered sugar n admix well till it dissolves .In another mixing bowl sift together all-purpose flour, Baking powder and Salt well .Sift it twice or thrice. 3. Now mix in the flour mixture to the mashed bananas little by little and mix well till everything is well combined without any lumps. Meanwhile prepare a muffin tray and line it with muffin liners. 4. Scoop out equal amount of batter in all the muffin liners. Top it with some nuts. Preheat the oven at 190 deg C for 10 min and the bake the muffin in 190 deg C for about 25-30 mins or till done. Always use over ripe banana for this recipe. You can also use brown sugar for a different texture. The baking time may differ from oven to oven so keep a check while baking. I used Red banana variety for this recipe .But any overripe banana can be used.